Classics like vanilla and chocolate, unique treats like salted caramel and maple walnut—you decide at Connecticut’s best ice cream parlors. While some are seasonal, offering up that perfect sweet treat to cool off in the summer sun, others are open year-round, so you can get your favorite flavors no matter the temperature! Here are our favorite ice cream parlors in the state. This seasonal creamery serves homemade ice cream made daily in-house. Flavor options include creative twists with hilarious names. Some of the standout flavors are “Bad Attitude” with dark chocolate ice cream and salted caramel swirls, “Parent Trap” with vanilla ice cream with peanut butter Oreos and peanut butter, and “Brown Points,” which is vanilla ice cream with caramel and brownie. After selecting your ice cream off their extensive menu, relax with your cup or cone in the gazebo or on a bench among the flower gardens. Wentworth’s has more than 30 flavors to choose from including coffee, butter pecan, and cookie dough. Decadent toppings are also available to make your ice-cold sweet treat even more satisfying. Located at Mitchell College and often staffed by students, Michael’s Dairy is a local favorite. Open seasonally, they serve favorites such as birthday cake, campfire s’mores, coconut almond, and monster mash. The grounds of Michael’s Dairy provide a relaxing green space to enjoy a scoop or two. Though a bit difficult to get to, Buttonwood Farm is really worth the drive, especially if you visit in late July to marvel at the fields and fields of sunflowers. Buttonwood Farm plants acres of sunflowers to attract visitors and sell sunflower bouquets, with 100 percent of proceeds donated to Make-A-Wish Foundation. Ice cream flavors also sometimes incorporate sunflower seeds—go ahead, get another scoop. Another New London favorite, Berry’s Ice Cream and Candy Bar offers up amazing ice cream and milkshake options. The delicious Thames Thin Mint hits it out of the ice cream park, and other creative menu items include ice cream nachos (scoops of ice cream with pieces of cone), sundaes, and massive banana splits. 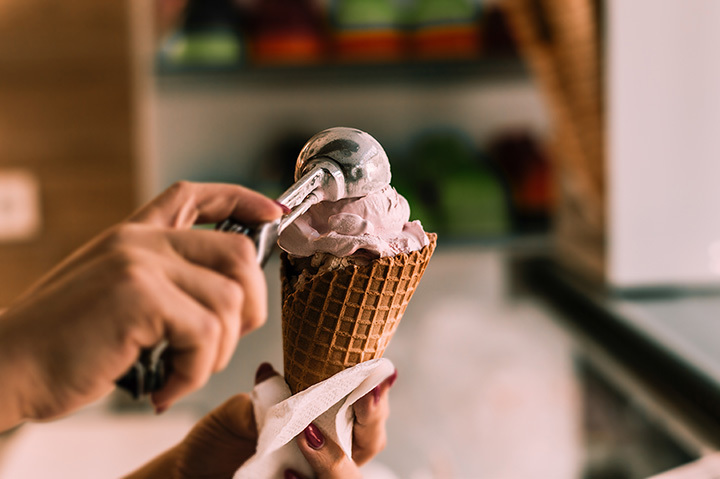 No matter the season, Connecticut locals love to stop by Rich Farm Ice Cream Shop for a cup or cone of their favorite. They feature flavorful daily specials, sometimes incorporating local products. Daily flavors include maple walnut, cookies and cream, peanut butter cup, and more. Ashley’s has been serving delicious ice cream for over 30 years. Ice cream flavors are delectably delicious and include lemon pie, espresso bean, and of course, vanilla. All of their ice creams are made using only natural ingredients and colors. Grassroots Ice Cream produces fresh artisan ice cream (and cake!). Flavors and toppings are all natural and organic such as strawberries, peaches, nuts, and more. Their unique options push ice cream flavor boundaries like pear lavender sorbet, apricot white chocolate chip, and cardamom cashew. This is certainly the ice cream parlor to try if you are looking for something new. Located in the tiny town of Salem, Salem Valley Farms Ice Cream boasts up to around 80 flavors, depending on the season. They even serve low fat, dairy-free, and vegan ice cream options. Sundaes, shakes, and old fashioned sodas are also available. The top draw for visiting Mystic Drawbridge Ice Cream is its excellent location in downtown Mystic, with unobstructed views of the Mystic River Bascule Bridge (the Mystic Drawbridge). Ice cream flavors unique to Mystic Drawbridge Ice Cream include “Mystic Mud,” “Mystic Turtle,” and “Seaport Salty Swirl.” Mystic Drawbridge Ice Cream is open year-round for all your ice cream needs.